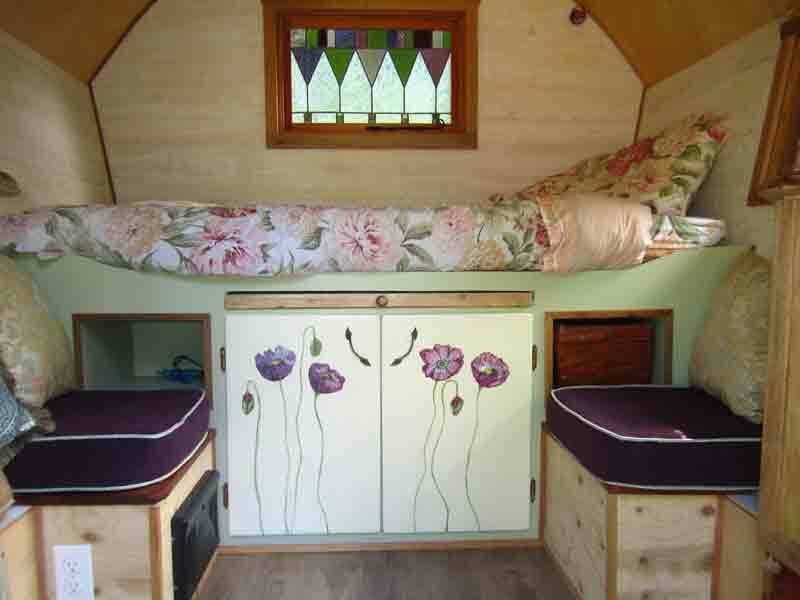 If you have built a caravan and would like to show it here, please get in touch! 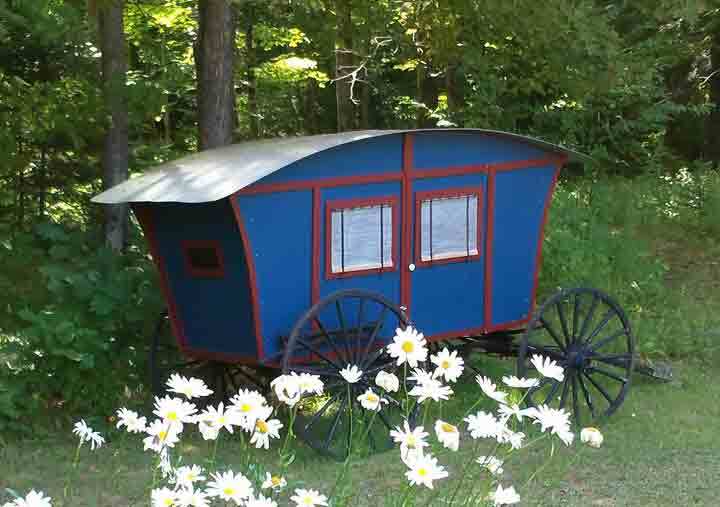 In the fall of 2005, Rae came to the farm to build a new caravan to replace one she'd made several years earlier for her SCA character. 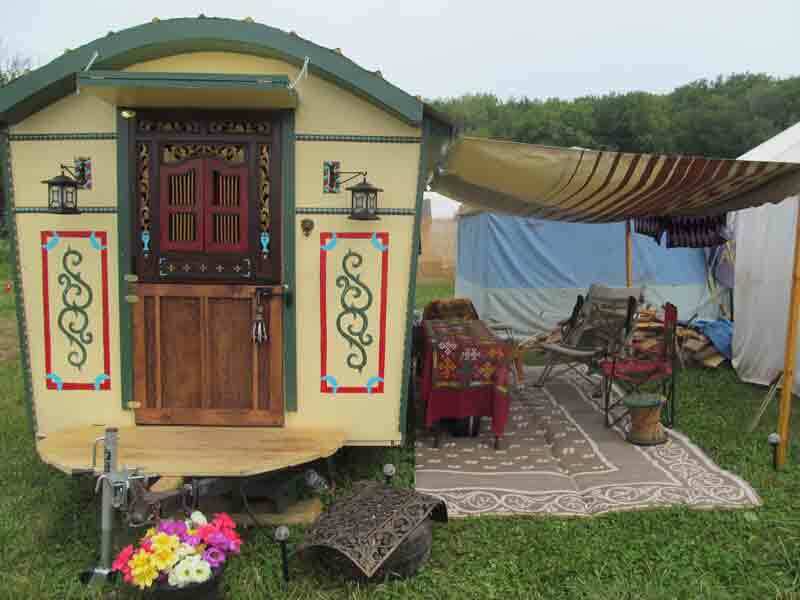 She tells the story of building her caravans on her website. 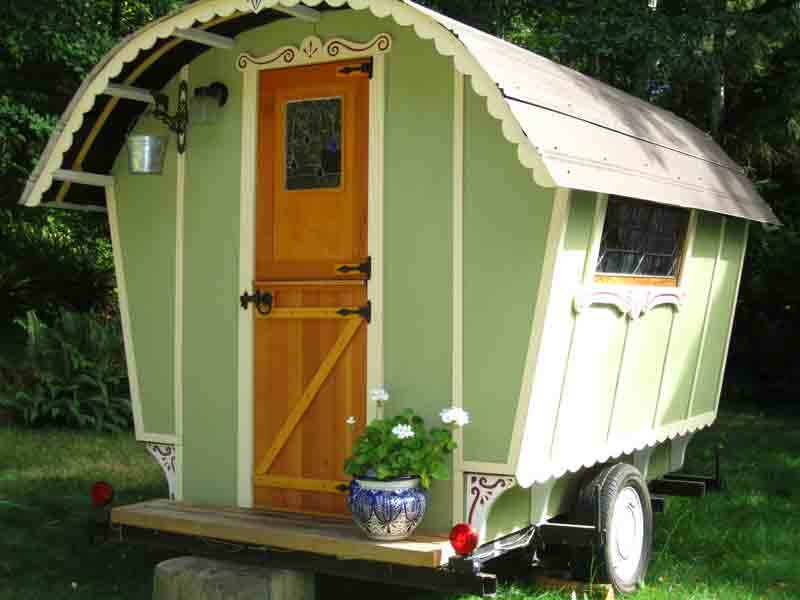 Check Rae's Links for many more amazing caravans. 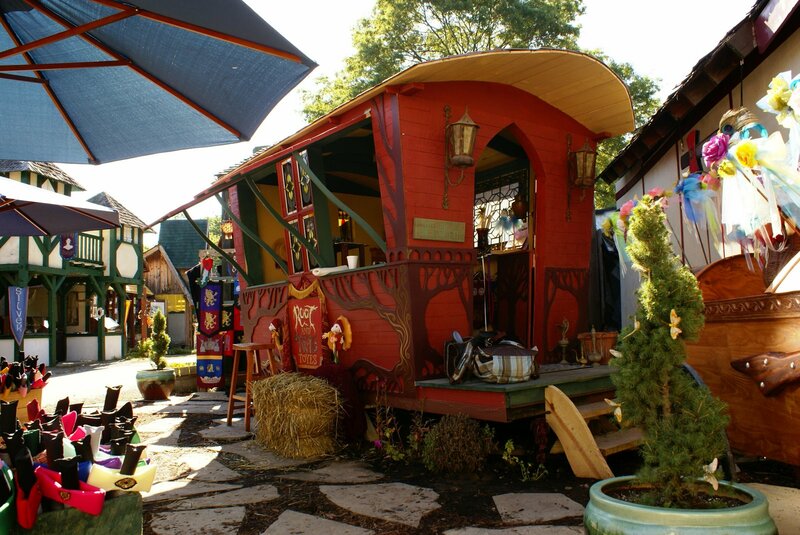 Jordyn emailed some questions in 2014, and here's the beautiful caravan she and her family created over the winter and spring! 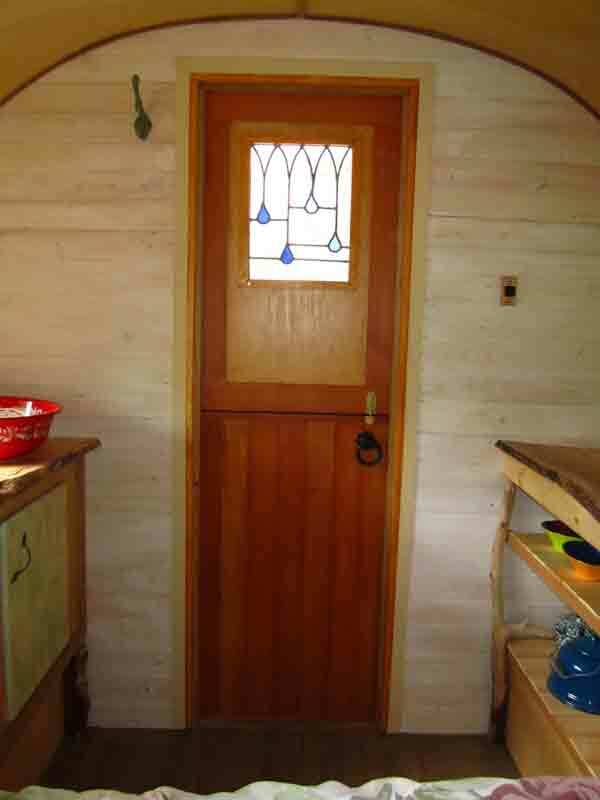 I like the fact that the porch is made of separate boards, not part of the interior floor. This way, when it weathers, the boards can be replaced easily. 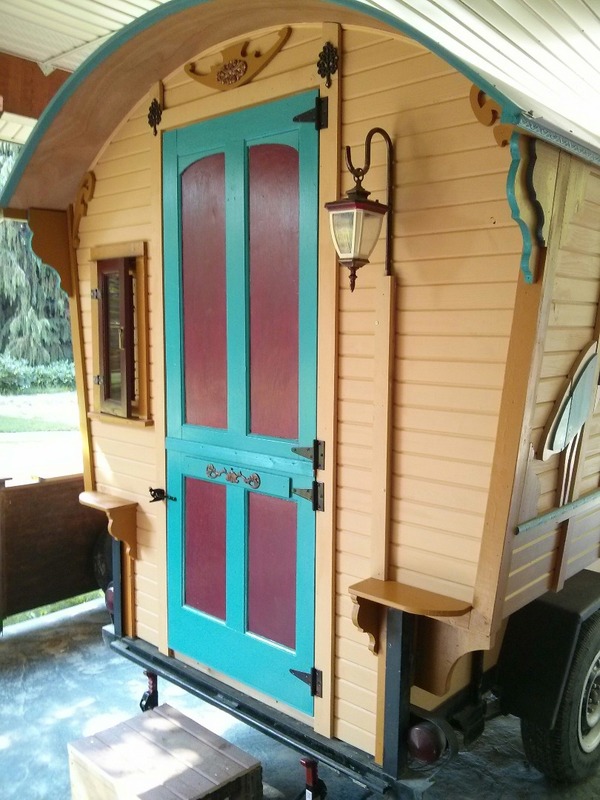 Only a few months ago, Jane bought an old 6`x8`trailer that turned out to be the back half of a pre-WW2 pickup! 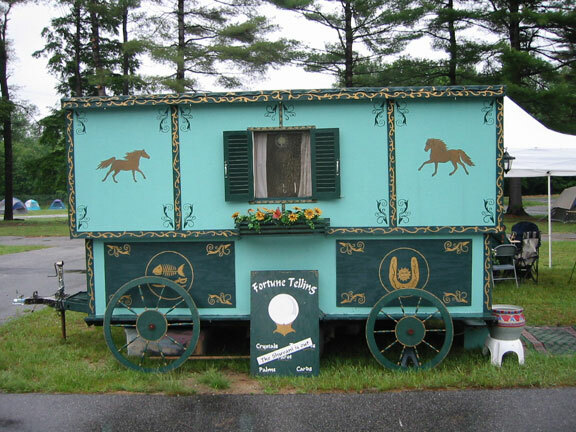 It transformed into a simple Reading caravan. 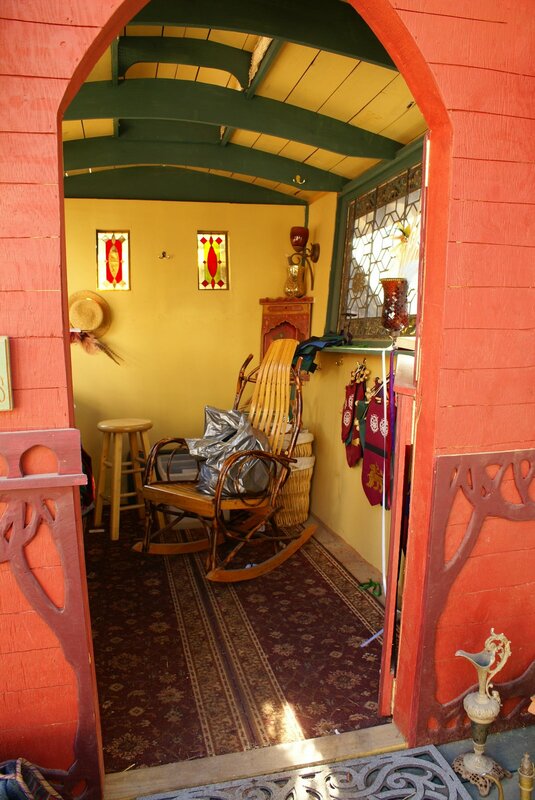 This is a great style for spaciousness, as long as it starts out wide enough. 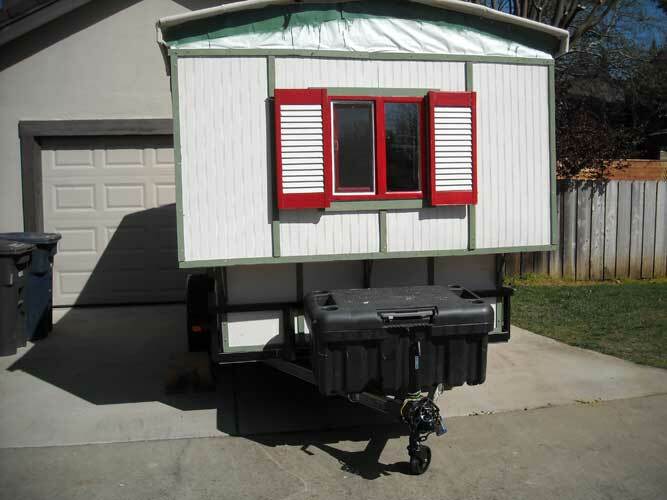 And now, she's bought a second trailer! 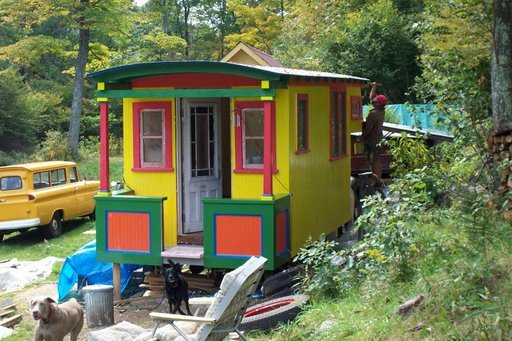 Scott lives nearby, and in the spring of 2015 he looked over one of my finished caravans to get an idea how to start his own. With some help creating the curved roof and putting in the roof beams, he's done an awesome job. I love all his extra scroll work! 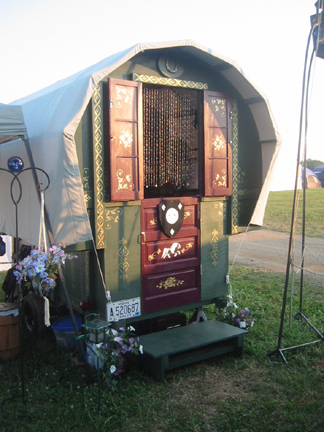 It seems very appropriate that this caravan's first trip was to Pennsic! Have a look at this new life for a classic 1938 truck! 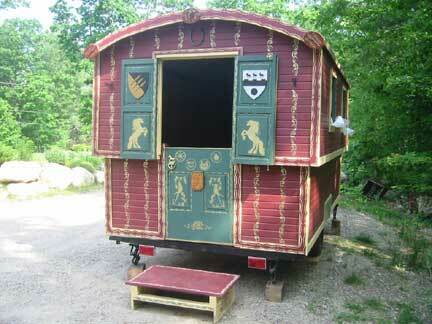 Here's a new caravan, spring 2009. 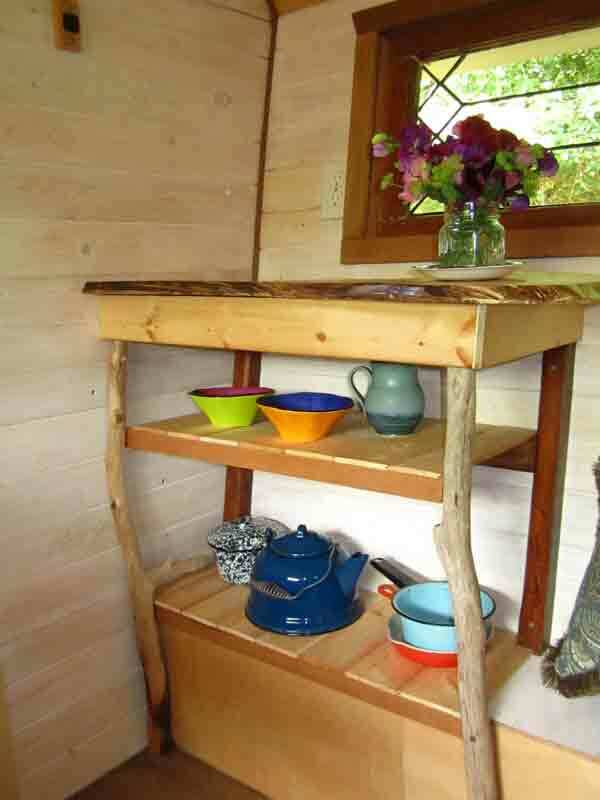 Linda built it herself, and is already making improvements. 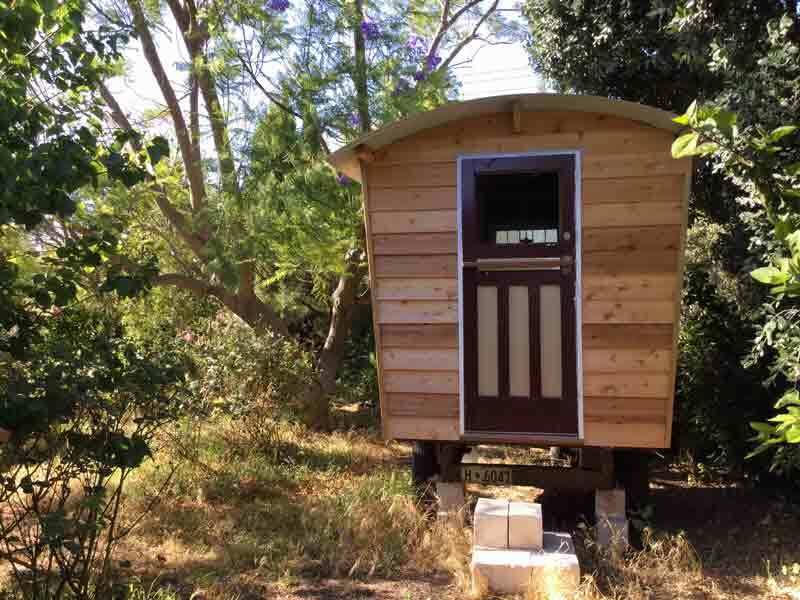 (that's what we do.... over and over and over) I love the door on the side - it must change the feeling of the inside space amazingly! 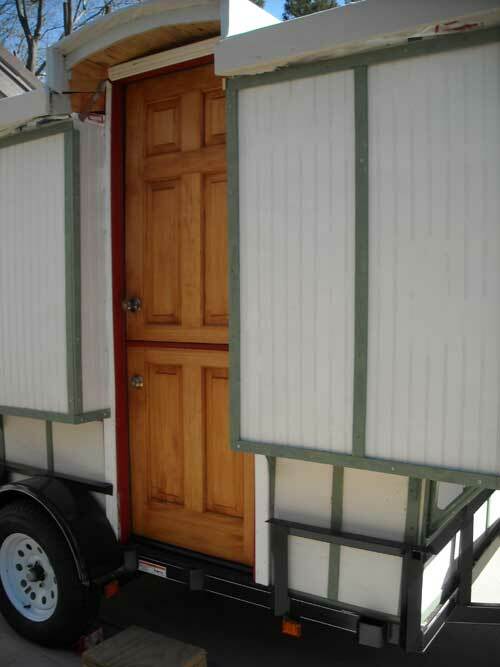 "The 'van is essentially finished except for the interior finish work, which I expect to chip away at over the next few months. 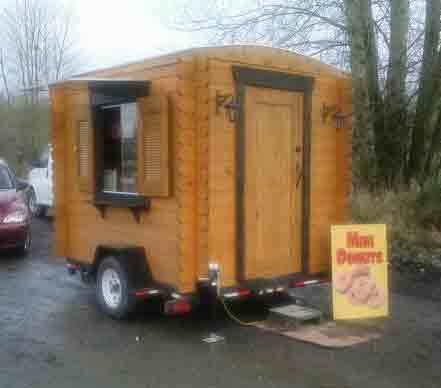 I pulled it up to Medford OR two weeks ago and went camping with my son and granddaughters. The 'van was easy to tow, although my gas mileage was AWFUL. We stayed quite cozy in it, and though it rained every day we were there, not a drop got inside. The girls loved it. Coming home, I discovered the canvas roof was beginning to ripple and flap. By the time I got home, there were a couple of tears in it. 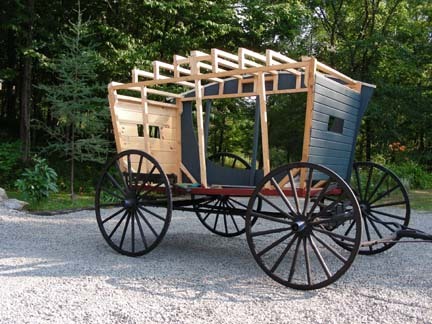 So, I am building an entirely new roof, designed to be more aerodynamic (better gas mileage??? ), and plan to be much more aggressive gluing down the canvas. I also found some 1" wide aluminum strips in the flooring department at Home Depot, and I will lay them front to back over the canvas, about 12" apart. With the heftier adhesive job and the screwed on metal, I hope the roof will be as good as the rest of the van." MidKnight Construction, Lundegaard Armoury I love the whimsy of this one, and of all his Ren Fare buildings! 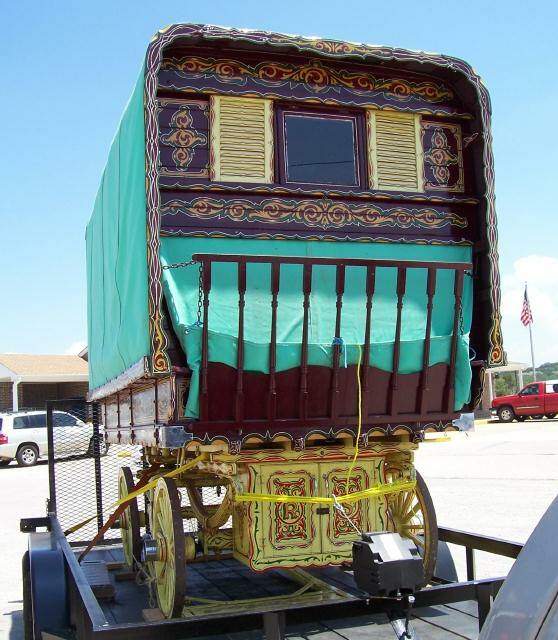 Gypsy Jib is a Romany dictionry published in England in 2003 by James Hayward. I enjoyed his family history and really appreciated all James' photographs, short anecdotes and explanations scattered throughout the book.